Some projects have clear, concise histories. This is not one of them. 323 Taughannock started off in the summer of 2014 as a $3.5 million, 23,000 SF mixed-use building with ground-level office, 18 covered parking spaces, and 20 apartment units on the three stories above (total of four stories, 50′ height). The firm proposing the building was Rampart Real LLC, managed by local lawyer Steve Flash, who partnered with businesswoman Anne Chernish to develop the plan. Flash had long had an interest in Inlet Island. He was an original co-owner of the Boatyard Grill restaurant on the island, and is an owner and co-manager of the nearby Finger Lakes Boating Center. In 2007, he sought to build a five-story condo/hotel on Inlet Island, and was shot down. If you think Ithacans are opposed to development now, take a look at the previous link. Current affairs don’t hold a candle to how anti-development the community and many local elected officials were for much of the 2000s. But Flash continue to scout out opportunities where he might be able to do something in time. He picked up the vacant, rundown former bar at 323 Taughannock Boulevard for $280,000 in July 2011. 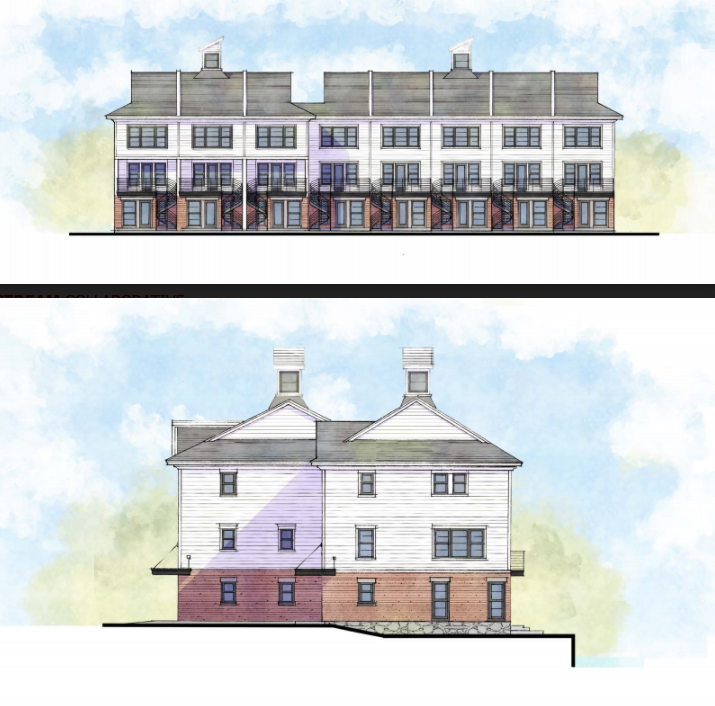 The apartment plans, which were designed by STREAM Collaborative, were reviewed, revised, and approved by the city. Although the original plan was to build the apartments out from January – August 2015, the project had been unable to move off of the drawing board and into reality due to cost concerns related to “parking, soft soil, and relatively tight space,” according to Flash. Being on the waterfront means that the soils have a high water table and are easily compressed, making multi-story construction difficult. The challenges faced with the apartment building were complicated by the proposed first-floor parking, which posed constraints on the building’s structuring, and raised construction costs beyond feasibility. Long story short, although the approvals were in place, the cost projections became too steep for the developers to follow through, and the site sat quiet. With the original plan no longer feasible, a replacement development plan was submitted in December 2016. This was a proposal for eight for-sale townhouses. Totaling 20,174 SF it’s effectively 16 units in eight townhomes – the first floor will consist of 8 studio type apartments that could also be used as commercial space. The second and third floors, which have separate entrances, will be occupied by 8 townhome style 2-story units. The original idea was that they could be live/work spaces, or that renters would live in the studio units and their rents would help cover the mortgages of the townhouse owners. Offhand, I remember they were to be in the upper 300s to low 400s price range. The general aesthetics of the design remained the same – as with the apartments, the for-sale townhouses are being designed by local architecture firm STREAM Collaborative. The facade “features historic and contemporary elements of rustic bricks, steel, traditional clapboard siding, and window casings”, per STREAM’s website. Five of the townhomes are larger – 645 SF studios with 2 bed/2 bath 1,608 SF units above, for a total of 2,253 SF in the “Unit A” townhouses. “Unit B”, with three examples, is a little smaller, with 514 SF studios and 2 bed/2 bath 1,384 SF upper-level units, for a total of 1,898 SF (the IDA application shows slightly different square footages for each unit, probably due to design revisions). Four units will have private elevators. The property will be landscaped and include eight on-site parking spaces with access to nine more next door. The public will have access to the waterfront on a paved promenade. During this second round of review, 323 Taughannock received some visual tweaks. Gone are the cute sprial staircases leading to the waterfront, and in their place are more standard treatments. The group of five had their balconies moved from the second floor to the third floor. The changes on the front are more subtle, with the window fenestration now centered on each unit, and the front doors rearranged (old version here). Overall, the design was still roughly the same, the changes were only in the details. The second set of reviews did get drawn out a bit because the project was caught up in the city’s TM-PUD affair, their fight to keep the Maguires from moving forward with their dealership at Carpenter Business Park. But the design fit zoning and was in line with the city’s desire for a more active, denser waterfront. The project was approved in May 2017. Six months later in November, Flash and Chernish sold a $203,000 stake in 323 Taughannock plan to Arnot Realty of Elmira, who own the Arnot Mall and some commercial and multi-family properties in the Elmira/Horseheads area. As 323T LLC, the new joint venture gave Arnot a 75% stake to Flash and Chernish’s 25%, meaning Arnot is now the primary developer. For Flash and Chernish, it gives them a much bigger partner with experience and connections to contractors; for Arnot, it gives them a toehold in the burgeoning Ithaca market, their first step into the city. One of the decisions made in this change of ownership was that the units went back to being rentals – very expensive rentals, to the tune of $3,400-3,500/month for the upper-level units. By HUD guidelines, that’s affordable to someone making $140,000/year. The studios will go for $1,400-$1,500/month. Seeking a ten-year tax abatement, sales tax exemptions and mortgage tax exemptions proved to be the most controversial part of this project, and to be fair, it’s a tough sell from a public relations perspective to say your ultra-luxury units deserve a $605,855 tax abatement. But the IDA decided that the long-term property tax increase would be worth it, and the project could potential spur development elsewhere on the island and the West End, and granted the exemptions in January 2018. One of the people who raked the developers and the IDA over the coals was Amanda Kirchgessner, back when she was a well-meaning citizen and before she became a highly controversial state senatorial candidate. Tompkins Trust Company has lent the development team $4.061 million to finance work on the 16-unit townhouse project on Inlet Island. 323 T LLC partner equity was expected to be $1.153 million at the time of the IDA application, but that may have changed, since the bank loan was only expected to be $3.461 million at the time – total project cost was $4.615 million. Ithaca’s Taitem Engineering is in charge of mechanical, electrical, plumbing, and structural design services. The builder looks like a newcomer – Benson Woodworking Company, working with applicant contractor D Squared Inc. (Doug Boles and Doug Dake) of Lansing. Benson’s primary work is as a modular and timber-frame builder for properties in and around southern New Hampshire where they’re based. With 323, the wood-frame wall system will actually be framed and sheathed off site by Benson, and transported over to be assembled by D Squared like pieces of a puzzle. The modular approach potentially saves on materials and labor costs makes the construction itself more energy efficient, and may make the logistics of the construction site easier to manage. The plan is to have the project be “nearly net-zero”, meaning it’s efficient in its energy use, and close to having all of its energy needs met by renewable sources (the project will be powered by an off-site solar array). For the record, yes it will use heat pumps. Taitem also designed the rather unusual timber-based pile system deployed at the project site. The project itself is relatively light as building go, but because of the waterlogged soils, a deep foundation is still required for structural stability. Instead of heavy-duty steel, treated timber can do the job for a fairly modestly sized project like this, an affordable, lighter-load alternative. As long as the timber isn’t exposed to high levels of oxygen (open air, there isn’t enough dissolved in groundwater), they can last for hundreds of years. You can see the piles in the photos below, and watch the pile driving process in the embedded Twitter video courtesy of Ithaca second ward councilman Ducson Nguyen. All the piles are in place, and a 6″ concrete slab will be formed and poured over the top. Construction is expected to take about eight months, roughly placing a timeline for completion at summer 2019.